"Information is power and PlanetJ has developed tools to empower the public safety community." 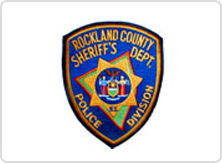 Rockland County Sheriff's Department in New York "is dedicated to the protection of life and property, reduction of crime through patrol and enforcement, and the provision of a safer environment in which citizens can live, work, and pursue a better quality of life." In leveraging today's Web technologies, The Rockland County Police Information Network (RCPIN) sought out ways to improve their systems in order to best carry out this mission statement. 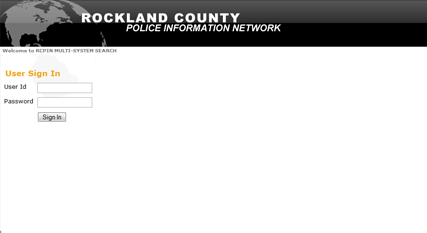 Rockland County, New York like many other government agencies has constant needs for information retrieval. Significant technical challenges exist because the information is distributed amongst various backend database systems used by the numerous agencies. For example, when law enforcement wants to search for information on a particular person, up to 4 different applications need to be accessed and searched individually resulting in safety vulnerabilities and lost productivity. To solve this problem, PlanetJ, using the WOW Multi-System Query Engine feature, teamed with Rockland county to produce several graphical browser based queries. These queries allowed entry of selection criteria which was used by the WOW engine to search multiple backend databases. Results that matched the search criteria are automatically combined and presented to the user on a single integrated screen. This provides a significant time savings for Rockland users and enhances public safety in cases where real time immediate information is needed. RCPIN gathers and collects a large amount of data from surrounding communities. What Rockland County needed was a single, efficient, and easy-to-use application that could retrieve data stored on various backend database systems and used by numerous county agencies. This application would need to be able to provide a quick way of collecting and providing data for detectives. PlanetJ created a graphical web application using WOW to provide a secure and fast way to obtain needed data. WOW first authenticates the RCPIN user and, with proper authentication, the user is able to access the information. If not, the login will be rejected. One of the detailed searches is seen in the screen below. Searching options include people, property, vehicles, and firearms across multiple systems. The user can also obtain pictures and drill downs into details associated with these people, incidents, or reports. Detectives or public safety personnel can now run fully secured searches across any number of regions and are able to make accurate decisions in a fraction of the time. PlanetJ has provided an amazing product that has opened avenues for public safety data sharing that did not exist or were too costly to pursue. Their WOW product is easy to use and cost effective. 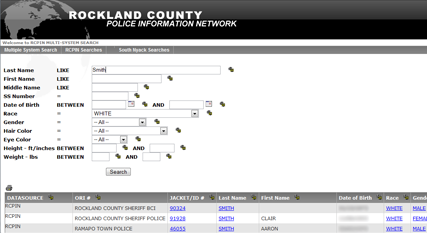 Most of all it provides me with a tool to write custom, web based, reports for the police community to use. The multi-system searches enable public safety officials to effectively and easily submit a search once to query multiple databases at multiple locations. This method of searching provides us with "real time" data as opposed to a central data repository that agencies upload their data to. There are many different record management systems out there for public safety and the WOW product allows you to effectively search these disparate systems."